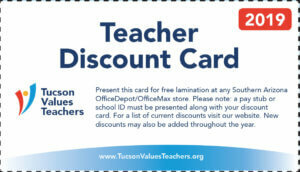 The January 2016 Tucson Values Teachers and OfficeMax/Depot Teacher Excellence Award was presented to Terry Duggan, Kindergarten teacher at Coronado K-8 School, Amphitheater Public Schools. We surprised Mrs. Duggan in her classroom, and it was clear from the excitement why Terry is such an EXCEPTIONAL TEACHER! Terry has been teaching at Coronado K-8 School for ten years, and has been teaching for 23 years. 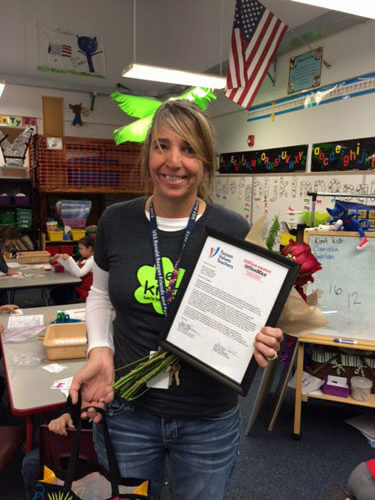 She has taught Kindergarten, First, Third, Fourth and Fifth Grades. As part of the honors, Terry receives a $100 OfficeMax/Office Depot gift card, a Teacher Excellence Award plaque, flowers and school supplies. Not to mention bragging rights! Thanks for all you do for Coronado K-8 students, Mrs. Duggan! Keep up the fantastic work!